Enjoy gourmet dining at Jeema Restaurant with an impressive international á la carte menu and live music, all set within the cosy interior. 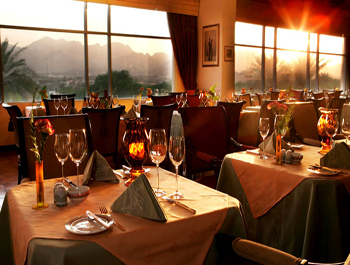 With breathtaking views of the Hajar Mountains guests can indulge in a selection of international delights complemented with a variety of fine beverages and the soulful sounds of ‘Perfect Rhythm’ who perform live at Jeema every evening. WiFi is available at Jeema Restaurant.